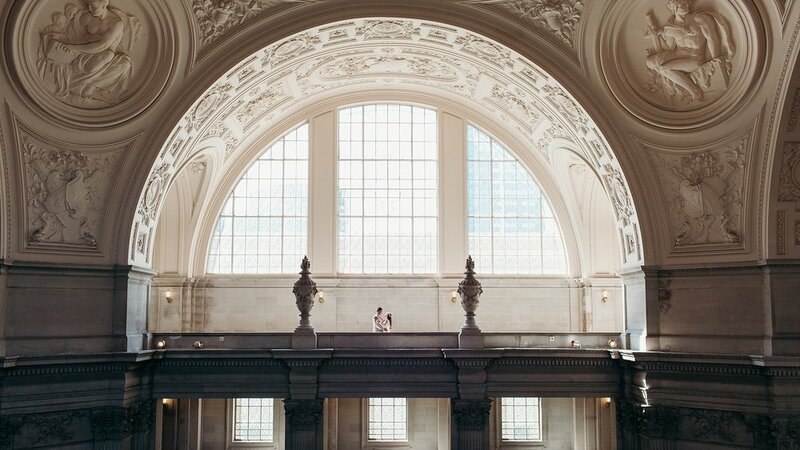 Whether you're getting married in front of your closest friends and family or eloping with just the two of you, San Francisco City Hall is a gorgeous and inspirational place to do it. The light is beautiful at all times of the day, providing stunning backdrops both inside and outside the building. Want to venture elsewhere for photos? We can do that too! 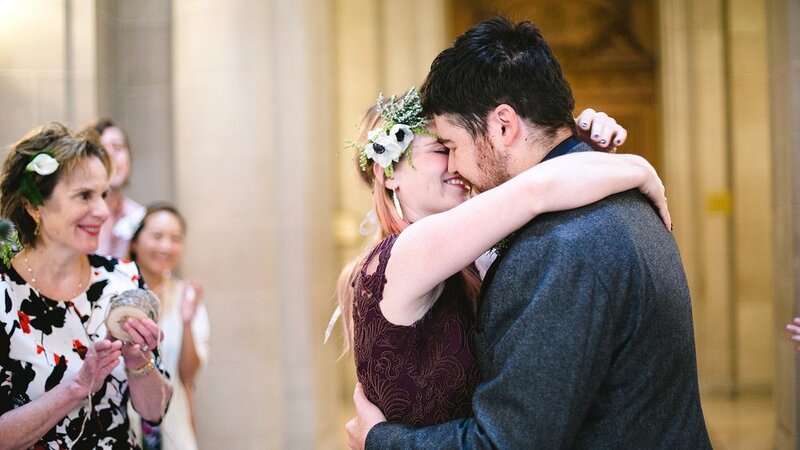 If you are looking to learn more about eloping at SF City Hall and getting some beautiful photos, get in touch! Did you know that you can rent a balcony for up to 100 guests on weekdays? You can event rent the balcony on Saturdays for parties of up to 200. This provides a beautiful marriage (no pun intended!) of a City Hall wedding with a more extensive guest count. Balcony rentals also allow you bring your own officiant, as well as give your own custom vows, two options that are not available for standard City Hall elopements. Weekday balcony rentals cost $1,000 and for an hour of time for up to 100 guests! Only have a few guests? Want to elope with your partner and avoid the fanfare of a larger wedding, but still capture beautiful photos? Along with being your photographer I'm happy to be your official witness too! Officiating is done by a City Hall volunteer judge, all of whom deliver moving mini-ceremonies. You can even get your marriage license an hour before your wedding which is great for out-of-town couples. These quick and intimate ceremonies are a bargain at $83 (not including marriage license costs) and can be booked here. Which type of ceremony is right for us? That's a good question, and one that's not always based on exactly how many guests you may have or what your wedding vision is! I'm happy to talk over the different aspects of each choice, both in terms of photography and planning in general. Let's check out San Francisco! After we get some beautiful City Hall photos it's always fun to hop in a cab and take advantage of another part of San Francisco. Plus, who doesn't love walking around town in a wedding dress? I'm happy to provide location ideas or venture to your favorite spot. Do I have to be a US citizen to get married here? Nope! I have photographed brides and grooms from Guam, Singapore, New Zealand, England, and more. Do your due diligence on researching your specific situation, and don't forget your photo ID day-of! Technically yes; a witness is required for paperwork (and up to two can sign, if you want to include someone else!). I am always happy to serve as the witness for couples eloping without guests. Can you help us through the process day-of? Yes! I've been to a lot of these, and the process can be a little bit daunting. I'm happy to serve as both photographer and City Hall tour-guide. Let's chat! My booking is simple: a 50% deposit and a contract, both taken care of online. City Hall elopements without balcony rentals cannot be reserved through their website more than three months in advance, so I won't take your deposit until you have a secured date that I can commit to attending. Yes! In fact, I'm partnered up with Ivy Hill Entertainment, who has a huge roster of musicians and bands with City Hall wedding experience. Check them out or ask me about adding music. Wear whatever the heck you want. A white gown is always gorgeous, but some of the best outfits have been colorful & unique! Elopements are all about breaking tradition and letting your personality shine through. Keep in mind that City Hall is not just a wedding venue! The building is right smack downtown, and can be subject to traffic problems, protests, special events, and really anything else that happens in a big city. Worst case scenario of arriving early: extra time for photos! The ceremony is short. REALLY short! City Hall's website estimates six minutes, and it feels like two. The process up until this point can feel a bit like the DMV, and it can be hard to shift mentalities, but make sure to be present in the moment during your ceremony. It'll be over before you know it! All of the officiants that I’ve seen have provided a heartfelt and emotional ceremony experience despite the time constraints. Custom vows aren't allowed, but can still be delivered at lunch/dinner after the ceremony or in your own private time. CHECK OUT SOME San Francisco City Hall WEDDINGS!